A sermon preached on November 25th – Christ the King Sunday – based upon John 18:33-38a. This sermon will not be like the vast majority of my sermons. It may sound like something of an academic lecture, and for that I apologize up front. When the scientific process was developed and refined leading to ever increasing insights into the nature of creation, these insights often came into conflict with a literal interpretation of Scripture. People felt compelled to take sides in a battle centered in the realm of biology over the theory of evolution. Was creation brought about by God in six days in the precise manner depicted in Genesis 1 with each separate species made in an instance, or did Evolution have it right with the long, gradual process it described? There seemed to be no room for gray. Evolution with its apparently random process of hits and misses seemed too haphazard to leave room for God. People felt compelled to choose between believing in God and the Bible or believing in the logical processes of Science, and that was quite unfortunate. 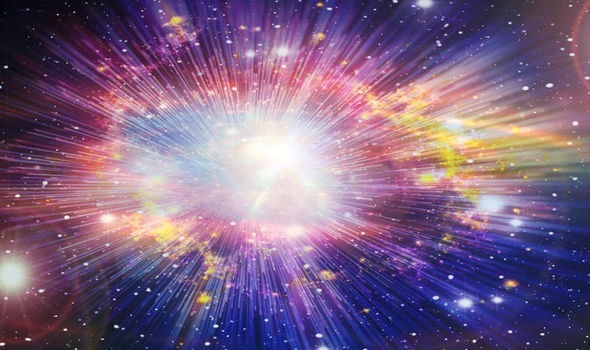 Last century, the science of cosmology — the study of the origins of the universe — entered the picture with the surprising discovery that there was an apparent beginning to the universe – the so-called “big bang”. A lot of the same sorts of Christians who felt threatened by Evolution seemed to find the big bang threatening as well. And yet, oddly if you don’t feel compelled to take Genesis 1 literally, both the notion of the Big Bang and the theory of evolution have a surprising harmony to the intuitions of the author of Genesis 1. First, there actually was a beginning to the universe. Before the compelling evidence for the Big Bang most scientists had assumed that the universe was static, unchanging, — that it didn’t have a beginning – it just always was. But no, there was as the ancient Biblical author intuited a beginning. And, as evolution suggested, we human beings came around at a very late stage of creation after most everything else, living and otherwise had already come into existence. That ancient Jew staring up at the sky had no way of knowing what the cosmology scientists have discovered regarding just how long the universe has been in existence: that the big bang occurred about 13. 8 billion years ago; that the earth didn’t come along before another 9 billion years had passed, that the simplest single cell life forms came approximately a billion years later, and that human beings didn’t appear until just a few hundred thousand years ago. To get a sense for this, if the time from the big bang till now were 24 hours then human beings have been around for all of 2 seconds; a very late entry to say the least. Religion has been the realm in which human beings have pondered these questions, but for the vast majority of human history religion was not much more than human beings attempting to control the things they couldn’t control that determined survival – essentially sacrifices made to unseen gods who it was believed controlled the coming of rain or the movements of animals that would lead to a successful hunt. But anthropologists who have studied the history of religion say something far more profound began to emerge almost simultaneously in distinctly different locations and cultures a little less than three thousand years ago – a very late development in “Big History.” To name but a few of these spiritual traditions — Buddhism in the East and the great Philosophers of ancient Athens and the Jewish tradition in Palestine – including the author of Genesis 1 – differing symbolic language was used to express the intuition that in contrast to this material world there was a deeper unseen, imperishable reality with a distinctly moral nature — a deeper level of truth – and that the purpose of our lives was about seeking to live in harmony with this truth – that there was a right way to live as opposed to a wrong way to live. In other words, the sages behind these various traditions asserted that the question, “What does it all mean?” had an answer: for instance, the author of Genesis 1 intuited an unseen, good God behind all that was, one who created a good creation — that life itself was inherently good. That life’s meaning was found in living in conscious relationship with this God who required of us a life of virtue that refrained from things like killing and stealing and lying; that this God cared about the less fortunate among us and expected us to do so as well. Perhaps because of the unfortunate centuries old hostility that arose between religion and science, the majority of scientists concluded that this distinctive quality of human beings – our capacity to ask the question of meaning – had no basis in a deeper reality – that the universe is essentially meaningless — that the only meaning that exists in life is the meaning we choose to create – a conclusion in which many of us would find reason to despair. Scientists can point to all kinds of horrible things that have been done throughout history in the name of religion to argue that the religious impulse was basically an delusion that needs to be outgrown. One of the things that religion has been used for is under gird the power of rulers. The authority of Kings was claimed to be divinely ordained which meant that if you rebel against the king you were also rebelling against the authority of God. But for the most part, kings are just political rulers who wear fancy garments, and with rare exceptions, the main drive of political rulers is to solidify their hold on power. For the most part kings are all smoke and mirrors – a fancy exterior that covers the many sinister deeds the commit to hold onto or extend power. We don’t hear much about kings these days, but one “king” has been in the news lately: the Crown Prince of Saudi Arabia. He has cultivated an image of being an enlightened leader who is trying to bring his country into the 21st century when in fact he is a ruthless autocrat intent on crushing all opposition. This recently came to light when a Saudi journalist who was critical of his regime and living in exile was lured into the Saudi embassy in Turkey, where the Crown Prince’s hit men quickly assassinated him. As it turns out, this appalling assassination is just the tip of the ice berg regarding the evils committed by the Crown Prince in his quest to hold onto or extend his grip on power. Thousands of critics have been locked up and tortured. And worse yet – something little attention has been given to – is the war that Saudi Arabia has been engaged in against their arch rivals, the similarly evil regime of Iran – using the small Arabic country of Yemen as the battlefield. It was recently reported that 85 thousand children have died of hunger as a result of this war. According to the United Nations, Yemen is the setting of the worst humanitarian crisis of our times. And Saudi Arabia fights this war with weapons they have purchased from the United States. So this long, long introduction brings me to our Gospel lesson. It involves the question of kingship. With Jesus standing before him as a prisoner, Pilate, the Roman governor asks, “Are you the king of the Jews?” Pilate knows what the kings of this world are all about. They are political rulers who wheel and deal in worldly power. Our lesson ends with Pilate asking, “What is truth?” What does Pilate mean by this question? On one level, it is an expression of cynicism but, ultimately I suspect of despair. He is saying there is no such thing as Truth with a capital T, there is no deeper meaning to life. All that matters is surviving – holding onto the little castle each of us attempts to build for ourselves where we can have a little pleasure and comfort until we return to the dust. Pilate clearly recognizes that Jesus has done nothing worthy of execution. The “right” thing to do would be to release him. But expediency is all that matters for Pilate, and he is in a bit of a jam here. If he doesn’t sentence Jesus to die the religious authorities may instigate a rebellion. Pilate is accountable to Emperor Caesar back in Rome and he likes his territories to be quietly subservient. A rebellion in Judea could lead to Caesar dumping Pilate. So the heck with doing the “right” thing — he does the expedient thing to hold onto power. He sentences Jesus to death. Possibly, possibly beyond the cynicism of Pilate’s question, “What is truth?” there lies a longing for there to be a deeper meaning to it all. Some compelling reason to do the right thing, but he can’t see it. The deep irony, John’s Gospel would have us know is that the deeper Truth glimpsed by all the great sages of the world is embodied in the man who stands in front of him willing to die upon the cross. John’s Gospel is very explicit about this from the outset. The first line of the Gospel echoes Genesis 1: “In the beginning…” It harkens back to the moment of creation and references something called “Logos” – the Greek word from which logic arises – the aspect of God translated in English as “Word” out of which God brought order out of chaos – brought into being everything that is. The claim here is that this Jesus reveals the nature of that mysterious, unseen power out of which all creation was made. To see Jesus is to see the heart of the Creator. The whole world. God loves every single human being. God loves every living being. And our purpose here on earth is to live as best we can in harmony with this love. Fighting violent wars that kill people, leaving little children orphaned and starving to death – that’s not what this King’s Kingdom is about. This King is the ruler of the unseen reality out of which our lives arises. But this King will not compel our love and loyalty with anything that resembles violence. This King simply invites our love, because love can only be given freely. So we were put on this earth to love… to be kind, to encourage, to forgive, and sometimes this is costly, as it was for Jesus.